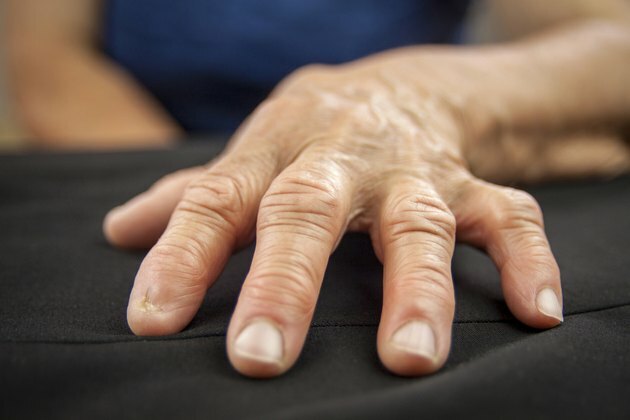 Although the wear-and-tear type of arthritis, or osteoarthritis, is much more common than rheumatoid arthritis, both frequently affect the hands. Diagnosis of rheumatoid arthritis, according to the American College of Rheumatology/European League Against Rheumatism 2010 classification system, is made by assessing the type of joint involvement, the duration of symptoms and the results of specific blood tests. The initial symptoms of this autoimmune disease can vary and may include fatigue, low fever, muscle aches and depression. The disease particularly targets the small joints of the hands and feet, causing inflammation, soreness and swelling. Over time, this can cause reduced movement, weakness and visible deformities in the hands. Pain in hand joints is a common rheumatoid symptom, with more than 90 percent of people affected after two to four years of having the disease, according to a July 2010 study published in the "Journal of Rehabilitation Medicine." At the onset of disease, though, only about a quarter of patients suffer hand problems. The hand pain is usually accompanied by joint swelling, and the affected joints may be slightly red or feel warm. Joints are often affected on both sides of the body. Joints may feel stiff, especially in the morning. Morning stiffness that lasts for at least an hour is typical of rheumatoid arthritis. In contrast, morning stiffness from osteoarthritis often clears up within a half hour. With rheumatoid arthritis, muscle weakness in the hands affects roughly the same amount of people as joint stiffness. Some people cannot properly form a fist. The muscles of the hands also can shrink and become weaker from disuse. Weakness, pain and stiffness can contribute to difficulties with tasks such as opening jars, twisting doorknobs and typing. Many people with rheumatoid arthritis have wrist symptoms early on, and wrist involvement increases to 90 percent after 10 years, according to a September 2014 study in the "World Journal of Orthopedics." Most common is joint instability at the little finger side of the wrist, whereby one of the forearm bones, the ulna, protrudes slightly. The hand also can become deviated toward the thumb side of the wrist due to continued joint destruction. Finger deformities are present in about 10 percent of people after eight years of disease. They can involve the knuckles and the set of finger joints beyond the knuckles. Deformities occur because of joint destruction and damage to the ligaments and tendons that normally hold the finger bones in place. The fingers can become angled away from the thumb. Also, the fingertips may point palm-ward with the nearest finger joint bent upward, like a swan's neck. In another similar finger deformity, the joint closest to the knuckle bends upward. Joint inflammation can also have detrimental effects on the nerves in the hand. Up to one in five people may experience loss of sensation or the feeling of pins and needles in the hand from rheumatoid arthritis-related carpal tunnel syndrome, according to an April 2014 review in the "Journal of Polish Orthopedics and Traumatology." Firm lumps under the skin known as rheumatoid nodules may develop in the hand and fingers, as well. Robbins and Cotran Pathologic Basis of Disease, 8th Edition; Vinay Kumar et al. Core Pathology, 3rd Edition; Alan Stevens et al.